The Microsoft Office Team after a while of testing this program privately has extended the preview to the public. Office Mix is a simple way to turn PowerPoint slides into interactive online lessons and presentations. Office Mix allows you to record audio or video of yourself presenting, write on your slide as you speak, insert quizzes, web pages, add interactive apps (like lessons from Khan Academy and CK-12 Foundation), polls, online videos etc., you also have the ability to screen capture and record anything from your screen. Your presentation is automatically loaded to the Office Mix website and transformed into a playable, interactive mix when you upload it. It also remains private till you share it. It’s designed to allow anyone take a PowerPoint document, mix it into an interactive, playable document that can be view on almost any device, with an internet connection. With Office Mix you get to Create, Engage and Evaluate with a lot of ease. 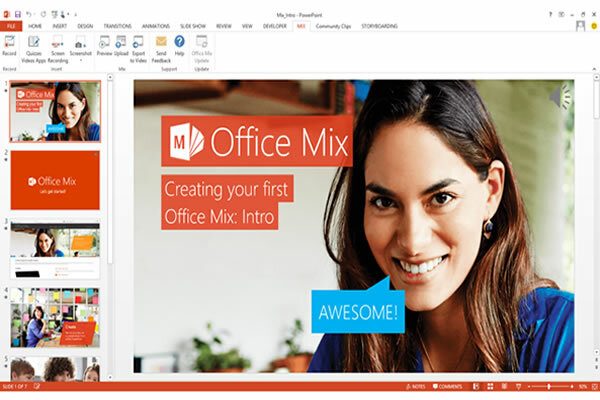 The Microsoft Office Mix customer preview is now available at www.Mix.Office.com . Office Mix requires Office 2013 SP1.